Today’s Photo of the Day is courtesy of this young eagle who landed on a branch outside Old Mission Gazette World Headquarters. Because our house sits atop one of the bluffs along Bluff Road, when birds land out front, they’re practically at eyeview. Well, depending on which branch they land on. 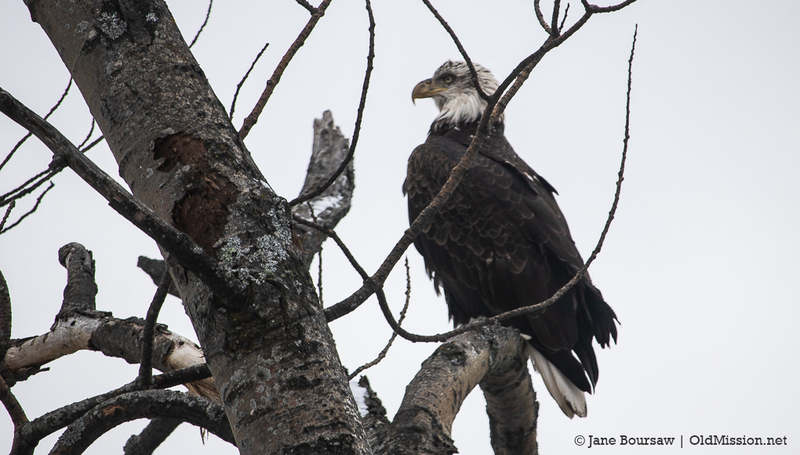 This particular branch is a favorite of hawks, eagles and other big birds. And of course, any time an eagle flies by, it causes a stir in the house and someone yells “Eagle!” and we all rush to the window to see it before those pesky crows bully it away. There were two of them on the ice about 3 houses down. They had a small animal of some kind and kept chasing it. Soon after, both took off with huge chunks of ice in their grip. A bit later Dave said one flew over his head very low and squawking. They love these gusty days. So much fun watching them. I love them so – especially when you’re outside and hear that “Northern Exposure” bird call when they fly overhead. Tim said he saw three eagles on the trees right in front of the house the other day. Magnificent.